Based on my output in this blog so far it should come as no surprise that I enjoy writing. The stuff I post here is for the most part written directly in RapidWeaver, the application I use to maintain this site. (Most of the text actually origins from the notebook I carry with me on the tube). For larger projects, not intended for web, I find that more specialize tools are required. One of my current projects is a children's novel and I have used this project to test the shareware application Jer's Novel Writer (JNW for short). JNW is made exclusively for OSX (sorry Windows- and Linux users). It is created by Jerry Seeger - himself a creative writer and this really shines through. For one thing, this is not your Swiss Army knife Word Processor. 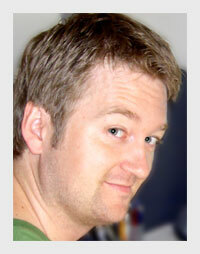 It does not bother with fancy layout options nor allow you to import a single graphic element. You may however create chapters, have a database of characters, places (or anything else you might fancy) and not the least, put notes in the margins. The killer feature for me though is the Full Screen Mode. No icons. No menus. Just a clean white screen to write your heart out on. 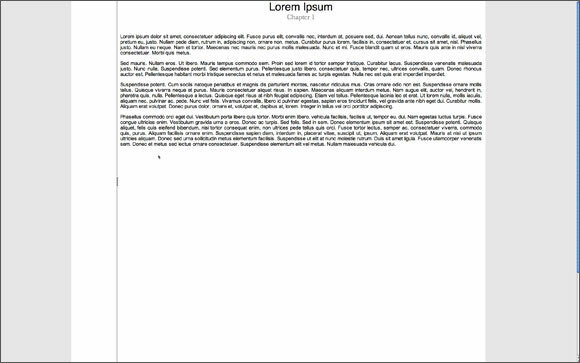 JNW will of course let you export your text to other formats, useful when you want to perform more complex layout tasks. It also has a nifty print function that allows you to define different print templates each with their individual fonts, font-sizes, line breaks et cetera. All this is done without altering your actual document. I guess it is quite apparent by now that I like JSW a lot. I am generally a fan of lightweight specialized apps and this is close to Nirvana in that respect. At $30 this is a steal. If you're still not convinced you are of course allowed to download a free trial version that's not limited in any way save from a nagging function. So ten* thumbs up from this blogger. 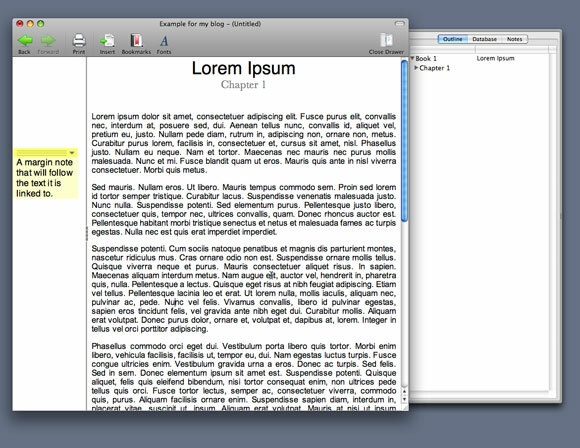 Jer's Novel Writer truly is an excellent piece of software, perfectly balancing the feature-set and user-friendlyness.